The International Seaweed Symposium Seaweed 2019 will be the 23rd seaweed symposium as one of the bigger seaweed event for this year. 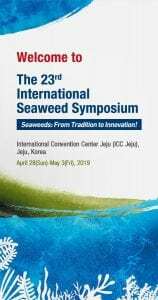 This year will be heald in Korea, hosted by International Seaweed Association (ISA), Korean Society of Phycology (KSP). For this year theme will be : From Tradition to Innovation!